The instrument below – a 5-string electric instrument made from Curly Maple from Oregon – is one of the more creative and challenging designs that a player has asked me to make. 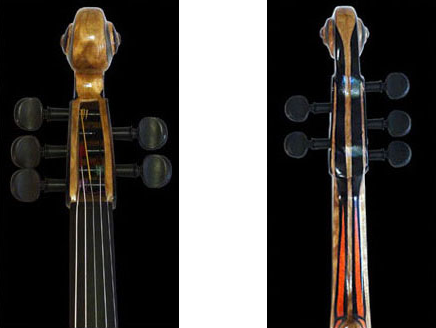 The player, who lives in the U.K. asked that there be a piece of orange-dyed Birch going around the instrument and up the back of the neck, finally ending in two points. The orange inlay was to be bordered on each side by a thinner ribbon of black inlay. 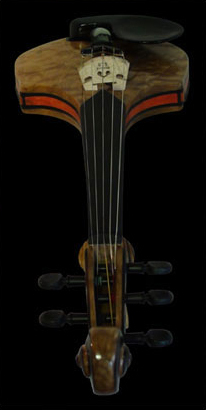 The fingerboard – ending in a “V” shape – the tail piece and the chin rest were all designed by the player, and I made them by hand, according to his drawings. The “snail shell scroll”, inlaid with black in a “Fibonacci curve” is perhaps one of the most interesting aspects of the instrument, and one that the eye is drawn to. The wood, selected for its complexity of figure, had a few beetle holes in the original piece of stock. Later, when cutting the instrument out, I discovered that the beetles had a bit of a feast in just the section of the wood that was to be the lower back of the instrument. I sent the player pictures of the beetles’ work, and we decided to use the wood as it was. This is a very unique instrument, and I learned a great deal during the process of making it.